Rediff.com » Business » Have Biyani and friends slowed e-retailers? Have Biyani and friends slowed e-retailers? Kishore Biyani, India’s very own Sam Walton, said at a recent retail summit in Mumbai that many online retailers would shut shop in the next six months. Rakesh Jhunjhunwala, the country’s answer to Warren Buffett, backed the man behind retail chains like Big Bazaar and Home Store and said e-commerce companies were attracting too much investment without causing any meaningful disruption. For how long can investors fund loss-making companies, Jhunjhunwala asked. Most of the big companies globally have been built from internal cash flows and not investors’ money, he added. Both questioned the business model of e-commerce companies and their apparent indifference towards profitability. On top of that, there was disbelief in the stratospheric valuations of e-retailers. The numbers tell a different story: Flipkart is valued at $15 billion and Snapdeal at over $6.5 billion, while the three listed offline retailers -- Shoppers Stop, Tata's Trent and Future Retail -- are together valued at below $3 billion. However, another set of numbers might show that Biyani’s argument has merit. All the three companies have reported a smart rise in net sales as well as net profit for the quarter ended December 2015. 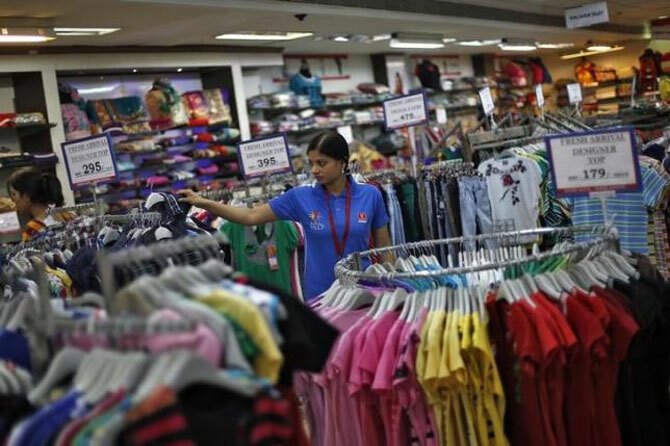 Aditya Birla Fashion and Retail too swung to a net profit of Rs 7.43 crore (Rs 743 million) for the quarter, from a loss of Rs 42.78 crore (Rs 427.8 million) a year ago. In comparison, the losses of the top 22 online start-ups in the country climbed almost three-times to Rs 7,884 crore (Rs 78.84 billion) on a combined revenue of Rs 16,199 crore (Rs 161.99 billion) for the year ended March 2015, as Business Standard reported recently citing a market report. The combined losses of Flipkart, Amazon and Snapdeal, the three top e-retailers, were Rs 4,984 crore (Rs 49.84 billion) during 2014-15. The losses could mount further this year as these startups continue to spend large sums of money on advertisements and discounts to lure customers, the report said. Does that mean it’s endgame for the online players while traditional brick and mortar companies would walk away as ultimate winners in the retail game? Not true, say analysts, stakeholders and industry watchers. While it cannot be denied that many have shut shop and several are struggling, the business case for e-retail remains strong. E-commerce offers both convenience of shopping from home as well as access to a varied range of products, according to the co-founder of the Bengaluru-based online furniture company. Arvind Singhal, founder of retail consultancy Technopak, agrees with Srivatsa. E-commerce as a model is there to survive, he says. Paucity of time is an increasing phenomenon in urban India and therefore nothing can be better than anytime, anywhere shopping, according to Singhal. Also, penetration of big brands is helping popularise e-commerce in smaller towns as their aspirations rise, he says. While Amazon India head Amit Agarwal had earlier said in an interview to this newspaper that the company had an open cheque book for India, Singhal says groups like Tata and Reliance Industries are getting into e-commerce in a big way because there’s opportunity there. He adds that while many e-retailers have shut down in the past years, many offline retailers too have lost money which has forced them to down shutters. In the meantime, the hybrid model, or a combination of online and offline, is being talked of as an alternative. Danish Ahmed, CEO of Shopsity, which operates an offline-online model, says the party is not yet over for either side as consumption is growing. As for profitability in e-commerce, he says companies would take long to make money until under-pricing continues. Shopsity is already profitable in less than a year of operation, according to Ahmed as “O2O (offline to online) is opposite of e-commerce’’. This model, which is about checking products offline and then buying them online, will disrupt e-commerce, he claims. For now, some numbers do hold a ray of hope for pure-play online players. According to submissions made to the Registrar of Companies and market reports, the combined revenue of Flipkart, Snapdeal and Amazon India grew by as much as 475 per cent in 2014-15 over the previous year. Also, these big players, while bleeding heavily, posted a drop in loss margins, to 158.4 per cent from 197.9 per cent in the previous financial year. On their part, e-commerce majors have maintained they can start making profit whenever they want to but they are focused on growth at this point. As Flipkart co-founder Sachin Bansal pointed out recently, signs of profits are already there. Myntra, a fashion portal that Flipkart acquired in 2014, has already recorded operational profit, for example. And if Goldman Sachs’s big number -- Indian e-commerce would breach the $100 billion mark by 2020 -- is a yardstick, online is not dying.